Eric Simonson, one of Mount Everest’s most accomplished conquerors, calls the 29,035-foot peak the world’s largest stage. Ashford-based International Mountain Guides, co-owned by Simonson, gave a historic performance on the south side of the world’s tallest mountain during the past eight days. Meanwhile, controversy is brewing after questionable performances by other climbers on the north side. • Sophia Danenberg, a 34-year-old Glastonbury, Conn., resident, became the first black woman to summit Everest. • IMG guide Justin Merle, a 27-year-old Auburn resident, became the first American this year to summit via the South Col route. • Guide Brenda Walsh, 33, of Seattle posted one of the fastest climbs ever by an American. • Guide Dave Hahn, 44, once again moved within one ascent of the Western record with his seventh trip to the top. However, the accomplishments are being overshadowed by an incident that took place on the opposite side of the mountain. On May 15, David Sharp, a 34-year-old English engineer, ran out of oxygen just below the summit. One mountaineer estimated 40 climbers passed Sharp on the way to the summit. Only one party among them stopped, but then continued on. Sharp died as they climbed past. Wednesday morning, Sir Edmund Hillary, the first man to summit Everest in 1953, denounced those who left Sharp to die. New Zealander Mark Inglis, who became the first double amputee to summit, told the Herald Sun that his party stopped but decided it could do nothing to save Sharp. Simonson, too, was appalled that so many climbers chose the summit rather than an attempting to save a life. While Everest, which has claimed nine climbers this year, is always deadly, the IMG expedition went well. “It’s not easy to assemble such a large group of climbers from so many different walks of life and see them really become a team on the mountain,” said Simonson, who has organized 16 Everest expeditions. Seattle’s Mark Tucker led this year’s expedition, which included members from the United States, Canada, Germany, Switzerland, Austria, Australia and Nepal. Danenberg, who climbs regularly in the Cascades, reached the summit with two others on May 18. Walsh needed just six hours to reach the summit the next day and two hours to return to high camp. While it was one of the fastest summit days ever by a Westerner, Sherpa climbers are faster. 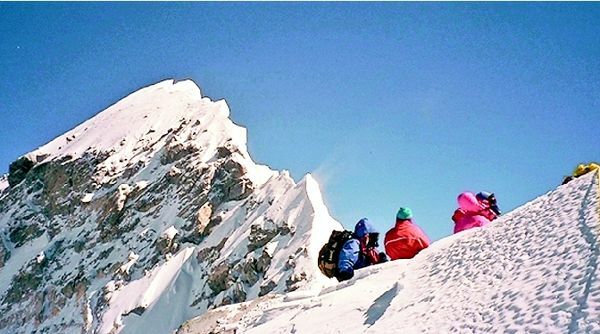 It is unclear what the records are for the fastest climb from 27,300-foot-high camp. Hahn set out this season to tie the Western record of seven Everest summits, but Romanian-born U.S. citizen Gheorghe Dijmarescu padded his record with an eighth summit in early May. Danuru Sherpa of Nepal also reached the summit for the seventh time as part of the expedition. Apa Sherpa of Thame, Nepal, pushed the overall record for most ascents to 16 this season. The IMG expedition is still on Everest and expects to return home by next week.